All software purchases are available in digital download format only – per the manufacturer. We no longer ship a CD-Rom. ZoomText – The world’s #1 low vision software + JAWS – The world’s #1 blindness/screen reading software have been fused together into one product called…. 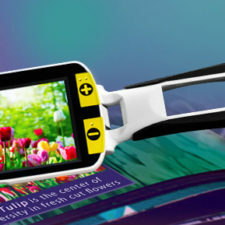 With the New ZoomText Fusion, low vision users have the ability to run ZoomText and JAWS together as “Fusion”; or low vision and blindness users can run ZoomText Magnifier/Reader and JAWS independently. Is your organization compliant with outside regulatory requirements and internal policies, for people who are blind and visually impaired? 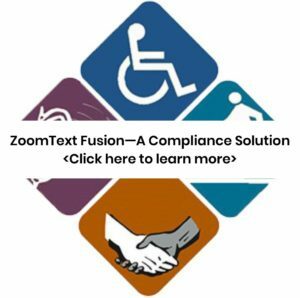 The new ZoomText Fusion is also a compliance solution. 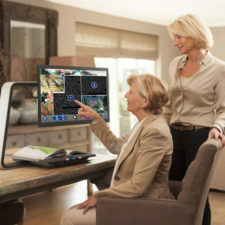 The New ZoomText Fusion is the best software available for anyone suffering with mild, moderate or severe vision loss. 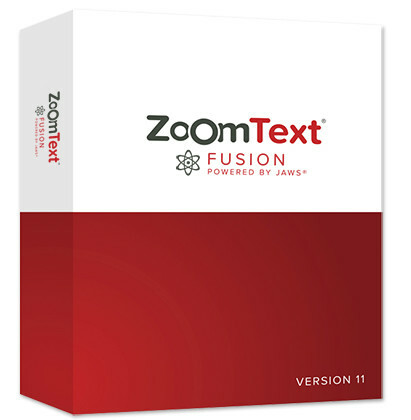 ZoomText Fusion combines the best features of both products – ZoomText screen magnification and visual improvements for screen viewing, combined with the power and speed of JAWS for superior screen reading functionality. By combining ZoomText and JAWS, Fusion provides flexible, high-quality speech using Eloquence and Vocalizer Expressive, powerful keyboard access and web navigation, and a broad range of customization options. 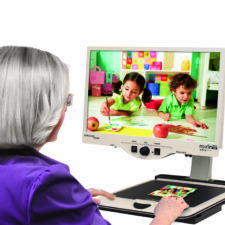 The New ZoomText Fusion is the right solution for schools, training centers, agencies, and businesses where individuals with vision loss are served. The single installer and license provides access to both the power of ZoomText and JAWS individually, or together when used together. The ZoomText development and test teams have delivered a very robust ZoomText that provides expanded support for Google Chrome and Mozilla Firefox, including full 32- and 64-bit support, stable magnification, and our popular Smart Invert feature. In addition, this update also brings a variety of compatibility fixes for popular applications, a new banner and sound cues that improve the usability of ZoomText’s layered command keys, and other refinements to the ZoomText user interface and localizations. Installation: If a previous version of ZoomText Fusion is present on the computer, VFO recommends uninstalling the older version via the control panel prior to installing the latest version. Pricing: All software purchases are available in digital download format only - per the manufacturer. We no longer ship a CD-Rom.